The latest report by the UN Intergovernmental Panel on Climate Change (IPCC) released in October last year warned we need to make urgent and ‘unprecedented changes’ in around ten years to keep temperatures between 1.5C and 2C. If we don’t then humanity and the planet faces significantly worsening risks of drought, floods, extreme heat and poverty for hundreds of millions of people. The report goes onto to recommend carbon pollution would have to be cut by 45% by 2030 if we were to stay under 1.5C. The IPCC mapped out various pathways to achieve 1.5C, these included changes in land use, technological change, reforestation and shifts to electric transport systems. A report published only months prior to the IPCC report titled, ‘What Lies Beneath, The Understatement of Existential Climate Risk’ by Daivd Spratt, Ian Dunlop and Prof. Hans Joachim Schellnhuber, suggest IPCC reports tend to ‘err on the side of least drama.’ Schellnhuber was head of the ‘Potsdam Institute’ for Climate Impact Research for twenty years, a senior advisor to German Chancellor Angela Merkel and the European Union. The ‘What Lies Beneath’ report suggests that the bulk of climate research from the IPCC tends to underplay the risks, exhibiting a preference for conservative projections and scholarly reticence. The authors also claim the IPCC reports tend toward caution and downplay more extreme and more damaging outcomes. This is dangerously misleading with the acceleration of climate impacts globally. The importance of this paper challenging the IPCC’s reporting lies in climate policymaking and the public narrative are significantly informed by the work of the IPCC. The ‘What Lies Beneath’ report also alludes to pressures exerted upon the IPCC by political and vested interests which is obscuring the real challenge. As well as scientists downplaying, softening and remaining silent about the seriousness of climatic impacts we have vested interests and media outlets reluctant to report these issues truthfully to the public. Under-reporting on these issues is also ‘irresponsible and limiting’ significant action. One climate scientist told me he presented at a climate conference in Europe on the challenges of climate change. Over ninety five percent of his presentation was devoted to the challenges and the enormity of the problem. Of the remaining five percent of the presentation (which happened to be taken out of context) reported in the media, the leading story read there was nothing to worry about. Today the world emits 50% more carbon dioxide (CO2) from the consumption of energy than it did 25 years ago, and the global economy has more than doubled in size. Humanity is consuming more resources than at any time in history, requiring the biophysical capacity of 1.7 Earths annually. With the planetary future being held hostage by short termism, vested interests and myopic national self-interest, the risks increase every day. The optimistic nature of humanity putting its faith in technology on the assumption that some ‘unproven and unscaleable technologies’ will save the day, at some point in the near future, exacerbates the inaction and apathy towards making significant change. A combination of dwindling resources and climatic shifts has already played out in Syria. More intense and frequent droughts linked to climate change, between 2002 and 2008, halved the country's total water resources. In 1996 Syria produced approximately 610,000 barrels per day (bpd) this declined to approximately 385,000 bpd in 2010. Oil a major financial windfall for the Syrian government was confronted with dwindling profits from oil exports and a fiscal deficit. In May 2008 the government was forced to reduce fuel subsidies tripling the price of petrol overnight. This price increase impacted the cost of food. From 2010 to 2011, the price of wheat doubled, fuelled by a combination of extreme weather events linked to climate change. Oil price spikes intensified speculation on food commodities - impacting Syrian wheat imports. Once self-sufficient in wheat production, Syria now became increasingly dependent on increasingly costly grain imports. In 2011-12 grain imports rose by 1 million tonnes, by 2012-13 this increased to around 4 million tonnes. Drought ravaged Syrian farmlands, led to several crop failures, and drove hundreds of thousands of people from predominantly Sunni rural areas into coastal cities traditionally dominated by the Alawite minority. The food price hikes sparked the protests that evolved into armed rebellion. The origins of Syria's 'war by proxy' can be attributed to converging climate, oil and debt crises within a politically repressive state. 2018 saw significant drought affect Europe, Argentina, South Africa and much of Australia. It is estimated the economic cost of the Australian drought could be as much as $12 billion. With expected continued hot weather to come into 2019 it seems like a good time to consider what the future of farming might be, not just in Australia, but everywhere. There has been significant coverage of the plight of farmers over recent months. Anecdotal stories and commentary reaching the media include: “this is by far the worst drought I have ever seen,” “the government has abandoned farmers” to “there was no rain at all to sow a crop this year” and “the rain events are fewer and further between.” These seem to be common threads within much of the farming community within Australia. While it is hard not to feel sorry for farmers it does raise the question, if the climate is shifting and creating more extreme weather events, then what does the future hold for Australian agriculture and food production? To answers this question it is worth revisiting the work of Jared Diamond who won the Pulitzer Prize for his book, Guns Germs and Steel. His follow- up book, Collapse: How Societies Choose to Fail or Succeed, gives a gripping insight into the challenges of farming in Australia. He dedicates an entire chapter of his book to Australia, highlighting the challenges which provide insight into what we might do to address the challenges. The chapter Diamond devoted to Australia was a critical look at why Australia is one of the most vulnerable nations on earth. Written back in 2005, Diamond words are just as relevant today, if not more so. Diamond suggests Australia is the most unproductive continent when it comes to agriculture. This is due primarily to Australian soils being billions of years old; hence they have become leached of their nutrients by rain over the course of time. Soils on average have the lowest nutrient levels, the lowest plant growth rates, and the lowest productivity of any country. Australia’s wheat belt, one of the most valuable agricultural areas, is effectively leached of nutrients and almost ‘all nutrients’ must be added artificially as fertilizer. As a result of the poor quality soils Australian has to deal with disproportionately high fertilizer and fuel costs. Without significant supplement from artificial fertilizers many of the areas would be unable to grow crops. His analysis also examines Australia's rainfall which is highly unpredictable in nature. Many of the early settlers and pastoralists were seduced into thinking the lands were lush and productive, they soon realised Australian rainfall is insufficient to raise crops to maturity on a regular basis. Diamond cites land degradation as one of the major environmental problems facing Australia. Poor land management practices, most of which is a hangover from the original settlers, have resulted in clearance of native vegetation, overgrazing by sheep, cattle, rabbits, soil nutrient exhaustion, soil erosion, man-made droughts, weeds, misguided government policies, and salinisation. These extensive land clearance practices of, overgrazing with sheep and cattle, along with vegetation removal, creates hotter and drier conditions. Soils are exposed to more direct sunlight as shade is removed impeding plant growth in much the same way as does a natural drought. There is much historical evidence to illustrate the impacts of clearing once forested productive areas and rainfall patterns. Studies are showing more plants make for more rain. Greenery can have a number of effects on a local climate. A study in Africa showed that vegetation effects account for around 30% of annual rainfall. Australia has one of the highest rates of tree clearing of any developed country historically. Increasing amounts of the Australian landscape is deforested and denuded by land-clearing, erosion and salinisation contributing to Australia's ever increasing greenhouse gas emissions equal to the country's total motor vehicle emissions. Over the last two years alone more than 700,000 hectares of forest and bush-land were destroyed in Queensland, making way for cattle farming and cropping. It is estimated that potentially another 3 million hectares will be destroyed in Australia by 2030. While land clearance has increased over the decades farm productivity has declined. In the 1960's, farm product accounted for about 12.5 per cent (on average) of Australia’s GDP. By the early 1980's, farm product had declined to less than 6 per cent of GDP. Today farm production accounts for about 2.5 per cent of Australia’s GDP. The most recent droughts have had a direct impact on the Australia’s overall growth rate, reducing this figure by at least one percentage point. In Diamonds estimation 99 per cent of the agricultural land makes little or no positive contribution to Australia's economy. It turns out that about 80 per cent of Australia's agricultural profits are derived from less than 0.8 per cent of its agricultural land. Diamond is critical in his assessment of the true economic costs of agriculture much of which are muted. The externalities do not fully measure the cost of permanent landscape degradation, especially the continuing damage to the Great Barrier Reef, worth significantly more to Australia than any extra agriculture being extracted. “Much of Australia's remaining agriculture is in effect a ‘mining operation’ that does not add to Australia's wealth, merely converting natural capital of soil and native vegetation into cash, with the help of indirect government subsidies ..."
While Australia currently produces more food than it consumes, being a net food exporter, its domestic food consumption continues to increase as its population grows. If that trend continues, Australia could become a net importer rather than exporter of food, that is, if other countries don’t have similar challenges. The four main exports of Australia include, beef, wheat, dairy and sugar all of which require vast areas of land and scarce water resources. All require constant fossil fuel inputs to be maintained and are highly vulnerable to water scarcity, extreme heat and cheap energy. 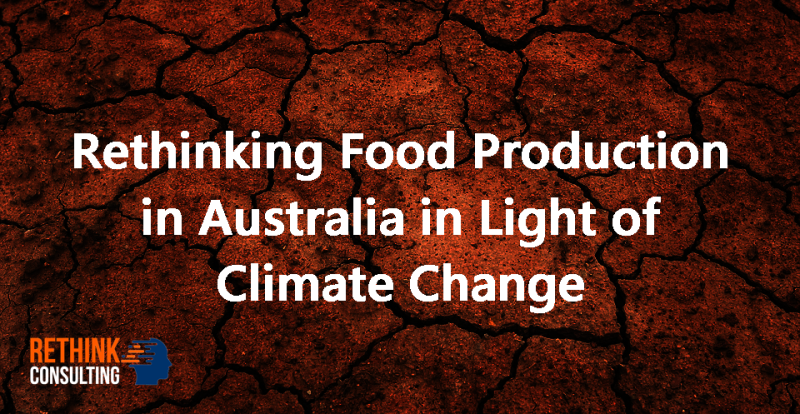 While climate change will be an influencing feature in the Australian agricultural sector over the coming decades, supply chain challenges will also create potential problems. Diamond outlines, many Australian historians speak of the "tyranny of distance" as an important factor in Australia's development. That expression refers to the long overseas ship journeys making transport costs per pound or per unit of volume for Australian exports higher than for exports from the New World to Europe. Products with relatively ‘low bulk to value ratio’ be can be exported more economically from Australia than ‘low value high bulk to ratio’ products. While the potential for disruptions to international trade is one thing, local distribution is another. In 2007 the Centre for Education and Research into Environmental Strategies (CERES) wanted to ascertain how far the average basket of goods travelled (for a typical food basket in Victoria) along with the accompanying greenhouse gas emissions. The total distance of the road transportation in the food basket (of 29 standard supermarket items) was 21,073 kilometres (km), almost the same distance to travel around Australia’s coastline. The total distance for all transportation of the food basket is 70,803 km, equivalent to travelling nearly twice around the circumference of the Earth. The accompanying greenhouse emissions were equivalent for all food trucks transporting all road-transported food items, over the total road transport distance, was 16, 989 tonnes (t) CO2–e. Australia to some degree carries the cultural identity of the original settlers, with cattle and sheep still dominating the Australian landscape. The appropriateness of many of Australia’s farming practices will come under closer scrutiny as vulnerabilities increase. Over recent decades Australia has gone from mining the soils and the landscape to mining minerals such as iron ore, coal and other industrial minerals. While Australia has ridden on the sheep’s back for some time so to speak, it might now be the perfect opportunity to rethink what we are doing and where we want to be. Having spent many years living in Australia, Diamond has seen first-hand how resilience the Australian people are and is slightly optimistic about Australia’s future. He believes Australia has a well-educated populace, a high standard of living, and relatively honest political and economic institutions by world standards, which holds it in good stead to make the changes needed. Before we can take positive steps towards a more resilient future we must ask a number of questions and challenge our current assumptions. We must ask ourselves: What kind of future do we want? Are our assumptions about the future based on reality? Is there a systems thinking approach to what we do? What are the alternatives and what is possible? There is no question Australia is a harsh and vulnerable nation. This provides opportunities, responsibilities and responses which build upon the challenges. Instead of continuing along the business as usual path, which will only exacerbate the problems and create greater vulnerability, we must all rethink our future. We must shift our thinking, ideas of what we want and how we do things. One of the most intelligent and proactive initiatives which has come out of Australia as a response to some of the challenge is the work done by the late Bill Mollison and David Holmgren who created the Permaculture concept back in the early 1970’s. Over the coming months we will share some of the more progressive initiatives, research and examples of what can be done to move toward a more resilient, productive and less energy intensive future. Excerpts from Rethink...Your World, Your Future. Sophie Gaballa Asha Bee Abraham, Food Miles in Australia: A preliminary study of Melbourne, Victoria. July 2007. Ceres Community Environment Park. Nafeez Ahmed, ‘Peak oil, climate change and pipeline geopolitics driving Syria conflict.’ The Guardian, 13th May 2013. Jared Diamond, Collapse – How Societies Choose to Fail or Succeed, Penguin Group (USA) Inc. Chapter 13, 2005. John Wendle, The Ominous Story of Syria’s Climate Refugees, Scientific American, December 2015. George Monbiot, The Climate Crisis is Already Here, but no one is telling us, The Guardian, Aug 2016.